Feel free to re-publish this article, preferably with link and credit. Paul Joseph Watson described Jeremy Corbyn as "a literal terrorist sympathiser", when reporting on the results of the British Election. That the right wing press set out to smear Corbyn as terrorist sympathiser is beyond all reasonable doubt. That the young and idealistic Corbyn did talk to Irish Nationalists viewed as Terrorists in the UK is entirely true. What is also equally true, and is core characteristic of a Limited Hangout Operation, is that only carefully selected facts are presented. Because the purpose of a Limited Hangout is misleading the public by the sin of omission. To be clear, nobody is accusing Paul Joseph Watson of telling lies, because that is not how a Limited Hangout Operation is executed. It is the censoring of crucial facts which presents a picture misleading the victims to jump to false conclusions that has been committed. For a person who made his break through into journalism by daring to speak truth to power, this is shocking. Watson described Jeremy Corbyn "a literal terrorist sympathiser" in the written article dated June 9th, entitled "Leftists Threaten Riots, Assassinations if British Prime Minister Remains in Office". So what is so very wrong with describing Corbyn as a Terrorist Sympathiser ? That Corbyn spoke to people such as Sinn Féin leader Gerry Adams is not in dispute. What is questionable is that by simply talking to which Jeremy Corbyn described as "people we don't like" during the national tv debates. The essence of Corbyn's philosophy is that War is bad, that we should talk to our enemies to negotiate a peace settlement. It should also be noted, that during that time period, the conservatives also talked to the same people - but in secret negotiations. The rights and wrongs of The Troubles and the eventual GoodFriday Agreement are not the subject of this article. Jeremy Corbyn, rightly or wrongly tried to talk peace with various terrorist groups throughout his career. Many people see his pacifist politics as naive, but that is worlds apart from supporting violent terrorism. To describe him as supporting terrorism only works by being highly selective with the chosen sourced quotes. The press simply quoted the first two letters of his answer, which was "NO" - but as you can see from the complete quote, that is what normal people call, "dishonest", but lawyers disagree. I will leave the reader to make up their own mind on the question of honesty. Is Corbyn "Chatham House" and connected with Bilderberg ? Watson went for the throat, by insinuating that because Jeremy Corbyn gave a speech to the Royal Institute, more commonly simply known as Chatham House that he was by implication an evil Globalist. The Infowars Team even went so far as to provide some "proof" by showing the headline from The Spectator magazine, whose edtior attended this years Bilderberg. Is Corbyn a minion of the European Union ? Corbyn is leader of a party that previously decided to be pro-EU in the referendum, perfectly true. Again, the sin of omission is failing to mention his exceedingly long record of fighting the European Union, objecting to its undemocratic nature, its oppression of ordinary working people, and other odious aspects of the European Union. Instead, the Fake-Alt-Media continues to describe Corbyn as if he is some Remainer, even though the Manifesto acknowledges the Mandate to Leave the European Union. Does he concede that the whole basis of the Maastricht treaty is the establishment of a European central bank which is staffed by bankers, independent of national Governments and national economic policies, and whose sole policy is the maintenance of price stability? That will undermine any social objective that any Labour Government in the United Kingdom—or any other Government—would wish to carry out. Does my hon. Friend recognise that the imposition of a bankers' Europe on the people of this continent will endanger the cause of socialism in the United Kingdom and in any other country? For constitutionalist minded patriots, this quote is especially interesting. If my hon. Friend is now envisaging the establishment of a federal Europe, will he not reflect that the Maastricht treaty does not take us in the direction of the checks and balances contained in the American federal constitution? It takes us in the opposite direction of an unelected legislative body—the Commission—and, in the case of foreign policy, a policy Commission that will be, in effect, imposing foreign policy on nation states that have fought for their own democratic accountability. Is Corbyn against the New World Order ? Many of us are gravely suspicious about the influence of freemasonry. I am utterly opposed to it and to the influence of other secret organisations because I believe them to be a deeply corrupting influence on society. Which leads me to conclude, that the Fake-Alt-Media is distorting the truth by the sin of omission to serve some "greater good", in the belief that "the ends justify the means". The reader is free to make there own conclusions, and I look forward to reading any comments with an open mind. Because for me, it is all about The Truth, not supporting an ideology. Re: Infowars coverage of UK Election - A Limited Hangout Operation ? I noticed that Corbyn also has complained about Trump policies which is probably another reason he is in the cross hairs of Infowars. Infowars linked to Daily Caller article with the headline "Theresa May SMACKS DOWN Anti-Trump Socialist In Parliament"
I am not sure if Infowars mentioned this important piece of information about the Home Office investigation into Terror. If I find a link though I will post it up. How do you supposedly fight terrorism if you do not go after those that fund and supply weapons. Home Office may not publish terrorist funding report amid claims it focuses on Saudi Arabia. But although it was due to be published in the spring of 2016, it has not been completed and may never be made public due to its "sensitive" contents. A spokesperson from the Home Office told The Independent a decision on the publication of the report would be taken “after the election by the next government”. But in a separate interview with The Guardian, a spokesperson said the report may never be published, describing its contents were “very sensitive”. Jeremy Corbyn and Tim Farron have challenged Theresa May over a long-delayed inquiry into foreign funding and support of jihadi groups in the UK, after the Home Office suggested the investigation may not be published. The inquiry into revenue streams for extremist groups was commissioned by David Cameron when he was prime minister and is thought to focus on Saudi Arabia. But the Guardian revealed last week that the report was still incomplete and its contents may not be published. The Labour leader used a speech in Carlisle on Sunday evening to challenge the prime minister over the delayed report. Corbyn referenced May’s speech after the London Bridge attack on Saturday, in which she said challenging terrorism would “require some difficult and often embarrassing conversations”. In a speech that also criticised May for ignoring warnings about the impact of police cuts, he said: “Yes, we do need to have some difficult conversations, starting with Saudi Arabia and other Gulf states that have funded and fuelled extremist ideology. I started to watch the second video at the bottom of the page, which was Alex Jones speaking.... I hit pause 1 minute into the video as he used the phrase "#never Trumpers . . .
"I want to tell all the Fake Libertarians, all the Fake Conservatives and all the 'never trumpers' . . . something, I'm not talking to Liberals right now, brainwashed zombies they don't listen they just scream KKK go away, KKK go away, KKK go away... I want to talk to people who claim they are actually for the 2nd amendment and claim they are for sovereignty and all the rest of it. Who still can not admit they are wrong about Trump. And come up to me on the street, or,or, in e-mails I get or comments I see on YouTube .. [silly voice] 'yea Alex what about Goldman Sachs'"
"And I've had Jesse Ventura call up my cell phone and leave a message and ... I think I'll get him on and debate this . . . and he go "Yea Alex what about all the Goldman Sachs people and what about all this stuff" Boy are'nt all of you eating crow right now, sure he has appointed 3 people who where in Goldman Sachs, all are anti-globalist on record and there pedigrees are good. Goldman Sachs is where the best people get recruited....and..and I always said so long as Trump goes out and actually gets people that know how to guide him through the wilderness"
Now the truth emerges: "US fuelled the rise of Isis in Syria and Iraq" Guardian. I bet this bombshell information will be part of an emergency broadcast to get out the truth. Many of us are gravely suspicious about the influence of freemasonry. I am utterly opposed to it and to the influence of other secret organisations because I believe them to be a deeply corrupting influence on society. I think refusing to support a politician brave enough to speak truth to power, because they are a socialist is an almighty mistake. That it is being done by an organisation that campaigned for around about a decade to not get sucked into the "False Left versus Right Paradigm" is the height of hypocrisy. Should we not be encourage people to ask questions as to whom Corbyn was refering to when he said "other secret organisations" ? Did he mean the New World Order, or the illuminati, or Bilederberg, or Skull & Bones, or was it Bohemian Grove ? Chuka Umunna has been holding secret talks with Conservative MPs about mounting a Commons ambush to force Theresa May to agree to a ‘soft’ Brexit. Mr Umunna, a former Labour leadership contender, met leading figures on the Europhile wing of the Tory Party last week to thrash out a joint strategy on the critical Brexit legislation about to come before the Commons. Opponents of a ‘hard’ Brexit in all parties see the mammoth Repeal Bill – which will place all EU laws on to the British statute book – as a chance to bind the Government into staying in the customs union and single market after we leave the European Union. The hung Parliament means Mrs May is vulnerable to amendments being made to the Bill by ‘soft’ Brexit supporters: 176 out of the current crop of 317 Tory MPs backed Remain in the EU referendum, in addition to the overwhelming majority of the 262 Labour MPs elected on June 8. If Mrs May survives Thursday’s vote on the Queen’s Speech – for which she will need the support of Ulster’s ten DUP MPs – the Repeal Bill will come before the Commons almost immediately. Tory MPs who have been holding discussions with Mr Umunna are understood to be keen not to ‘rock the boat’ with Mrs May by revealing their tactics until she has cleared the hurdle of the Queen’s Speech vote. The main Commons battles are expected after the Summer recess, when – if Mrs May is still in Downing Street – she is likely to face a series of knife-edge votes. It will coincide with the verdict of Michel Barnier, the EU’s chief negotiator, as to whether the UK is on track to achieve a Brexit deal in time for our exit in March 2019. If Mr Barnier says sufficient progress is not being made, it will hugely strengthen the hand of the soft Brexiteers who have been arguing for ‘transitional’ arrangements to be put in place to retain our current relationship with the EU on current terms for a number of years. 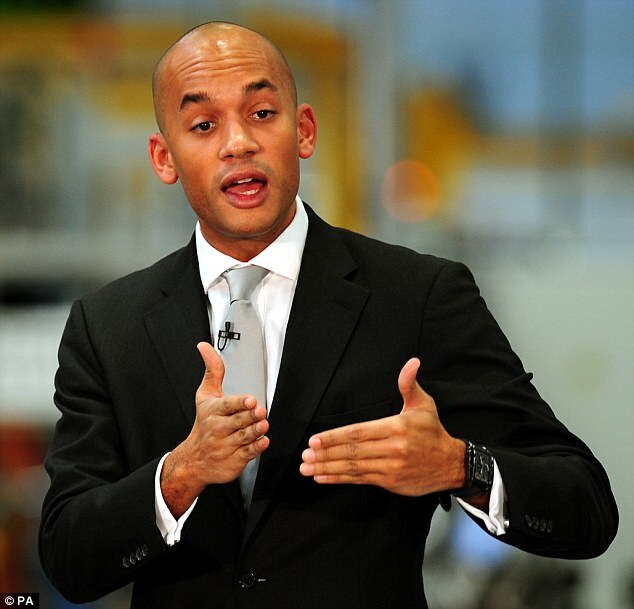 Mr Umunna, who had been planning to make a second challenge for the party leadership if Mr Corbyn had crashed to an Election defeat, was one of 50 Labour MPs who signed a letter last week saying they opposed his line on leaving the single market. The Liberal Democrats are also urging Labour and Conservative MPs to back an amendment to the Queen’s Speech this week, calling on the Government to propose keeping Britain in the single market and customs union. Mr Umunna declined to comment last night. Jeremy Corbyn has claimed that 9/11 was "manipulated" to make it look like Osama Bin Laden was responsible to allow the West to go to war in Afghanistan. It comes as Mr Corbyn prepares for his first conference as Labour leader. However, a number of Labour MPs are expected to use the conference to publicly state that the party is unelectable under Mr Corbyn. Lord Mandelson on Friday said that the party should only consider ousting Mr Corbyn after it is clear the public have realised the party "cannot be elected with Corbyn as leader". Mr Corbyn will attempt to use the Brighton conference to unite the party after it threatened to split apart in the wake of his shock election victory. Mr Corbyn was heavily criticised in the days before winning the Labour leadership after suggesting that the death of Osama Bin Laden was a “tragedy”. In the 2003 article for The Morning Star newspaper, Mr Corbyn wrote: “Historians will study with interest the news manipulation of the past 18 months. “After September 11, the claims that bin Laden and al-Qaida had committed the atrocity were quickly and loudly made. Labour on Friday said that Mr Corbyn will use the conference to focus on the economy, foreign policy issues and “participative politics”. However, in a sign of the divisions in the party, Labour admitted that “differences of opinion” will emerge during the conference. Mr Corbyn on Friday confirmed that he will work with the SNP to try and scrap Britain’s nuclear deterrent despite opposition to the move from his own backbenches. The Labour leader reaffirmed his long-standing opposition to Trident and said he would vote with the 56 Nationalists at Westminster on the issue. Left-wing activists will debate scrapping Trident at next week’s conference.